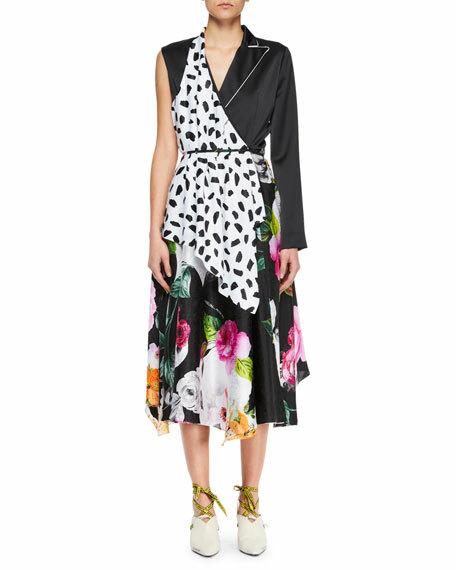 Off-White dress with floral and dot paneled print. A.L.C. "Nico" striped silk shirtdress. Notched collar; surplice neckline. Long, dolman sleeves; button cuffs. Elasticized waist. Front slip pockets. A-line silhouette. Midi length. Dry clean. Imported. Model's measurements: Height 5'10"/177cm, bust 33"/84cm, waist 25.6"/65.2cm, hips 35.8"/91cm, dress size US 2-4/FR 34-36. T by Alexander Wang knit dress. Scoop neckline. Spaghetti straps. Cross back with cutout. Sheath silhouette. Hem cropped below knee. T by Alexander Wang knit dress. Scoop neckline. Spaghetti straps. Cross back with cutout. Sheath silhouette. Hem cropped below knee. Pullover style. Modal/spandex. Imported. Model's measurements: Height 5'10"/177cm, bust 33"/84cm, waist 25.6"/65.2cm, hips 35.8"/91cm, dress size US 2-4/FR 34-36. 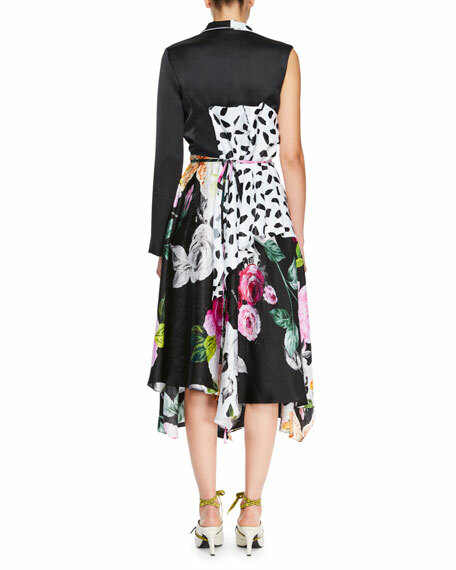 Catherine Deane "Lala" midi dress with tiered tulle skirt. V neckline; square back; scalloped trim. Sleeveless; thin straps. A-line silhouette. Catherine Deane "Lala" midi dress with tiered tulle skirt. V neckline; square back; scalloped trim. Sleeveless; thin straps. A-line silhouette. Hidden back zip. Dotted tulle skirt. Four tiered layers. Midi length. Nylon/rayon. Imported. Model's measurements: Height 5'10"/177cm, bust 33"/84cm, waist 25.6"/65.2cm, hips 35.8"/91cm, dress size US 2-4/FR 34-36. Cushnie et Ochs light power viscose dress. Deep V neckline. Two-way zip front. Short, kimono sleeves. Slim silhouette. Midi length. Cushnie et Ochs light power viscose dress. Deep V neckline. Two-way zip front. Short, kimono sleeves. Slim silhouette. Midi length. Viscose/nylon/spandex. Lining, silk/spandex. Dry clean only. Made in USA of Italian materials. Model's measurements: Height 5'10.5"/179cm, bust 32"/81cm, waist 25"/64cm, hips 35"/89cm, dress size US 2/4.